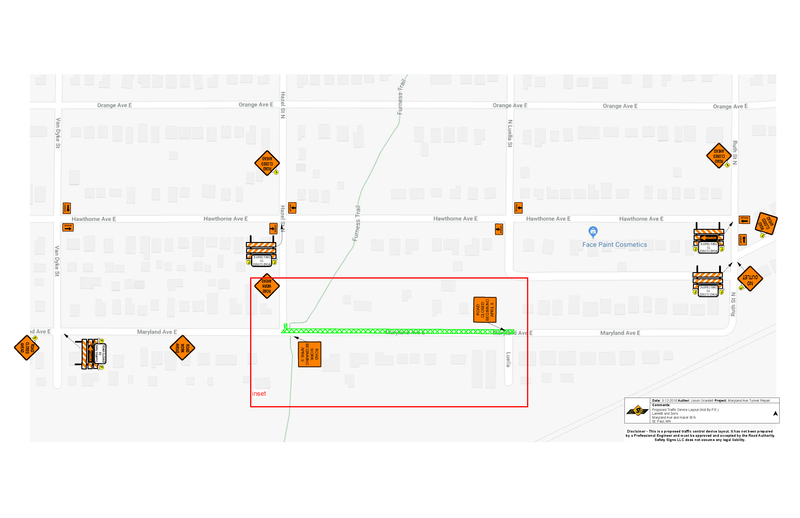 On September 17, 2018, a contractor working for the Saint Paul Public Works Sewer Utility will begin a sanitary sewer repair project. This project will impact pedestrian, bicycle, and vehicle traffic on Maryland Avenue between Hazel Street and Luella. The sanitary sewer repairs are estimated to be completed by October, 2018. Efforts will be made to minimize impacts to Furness Trail and access to private driveways. Maryland Avenue will be converted to a temporary “one-way” street (eastbound only) beginning at Hazel Street and ending at Luella. See the attached maps for pedestrian, bicycle, and vehicle detours. Furness Trail will be passable during construction. Private driveways will be accessible during construction. Concrete barriers, signage, and barricades will be positioned for safety purposes and to identify the sewer repair work zones.